Lakeland Party Bus is the top party bus company in Lakeland, FL and the surrounding areas. Our party bus is amazing, complete with a dancer's pole, fog machine, powerhouse sound system, and much more. The ultimate party bus is jam packed with awesomeness and all the bells and whistles you could want. And this bus is ready for any party, as it can hold 30+ of your favorite party animals that you can only be seen with at night! So for your next epic event, call Lakeland Party Bus and reserve the ultimate machine for the party of your life! Why rent our Lakeland Party Bus? Well, to begin with it is undoubtedly the best party bus in Lakeland and all of Polk County. It is full of features that will keep you and the peeps full entertained for your entire event. It has a savage sound system, fog machine, dancer's pole, comfortable leather seating, a 360 view, and a party atmosphere like none other. And when all 20 or 30 of your favorite groupies all pitch in $20-$30, it is super affordable! And it's huuuuuuge! 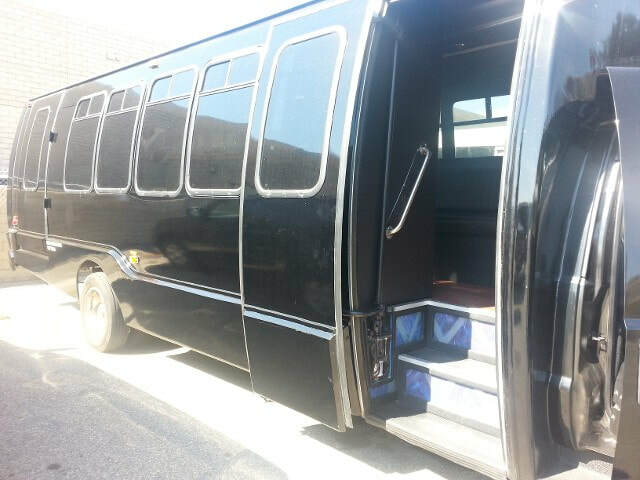 It can hold up to 32 people comfortably so everyone can hang together in our party bus Lakeland FL. Largest Party Bus in the area - holds up to 32 Party Animals! Potent 3000 watt surround sound stereo system...like a rock concert! Fiber Optic Lighting better than the Club! Dancer's Pole...who's ready to Party? How is this Epic Party Bus Affordable? Many of our party animals often wonder "how is this major league epic party bus going to be affordable for me and my girlfriends or buddies?" Well the answer is actually very simple! All you have to do is get you and your 30 friends to all pitch in $20 to $30 each and it's a done deal. When everybody pitches just a little bit you can make your epic party night a reality for less than a bar tab at your favorite happy hour! And create a fun night that everyone will talk about for years to come! Our gigantic, state-of-the-art party bus is absolutely perfect for any large group event. Whether you want your whole wedding party together throughout the entire day or you need the ultimate tailgating machine, our Lakeland party bus will be there helping you make some incredible and lasting memories. Why take two or more limousines out for the night when you can just fit everyone inside this huge 32 seat monstrosity? Attending an event in this epic party bus allows you to keep everyone together so you can all enjoy every minute of your special event as a group. Why Choose the Lakeland Party Bus? When you rent our party bus Lakeland from us you are guaranteeing that the party will get going from the minute you and your party are picked up until the time you are all safely dropped back off. There is no need for a designated driver so everyone can partake in the fun. While you and your guests are being professionally driven around by us your only task will be to sit back, relax and enjoy your special event to the fullest. When a group of people attend an event in our party bus or use it as a means of transportation for a special evening they all end up raving about what a great experience it was. As the group members are dropped off they can all be seen wearing smiles that are almost as big as the limo itself. It brings smiles of joy to our faces too when they say “thank you so much” and they “can’t wait to do it again." Lakeland, Florida’s premier large group limousine service definitely has a special way of taking ordinary events and making them into extraordinary affairs. What makes Lakeland Party Bus one of the most popular limousine rentals in Central Florida? It all starts with it plush seating that will comfortably accommodate 28 – 32 adventure seekers. But that is not all this absolutely incredible vehicle has to offer those that attend an important event or spend an evening in it. No need to go to the club when you have the Party Bus at your service. Its 3000 watt surround sound stereo system will rival any sound you hear at your favorite club. Want to catch some other game action as you are headed to your favorite sporting event? That’s not a problem thanks to this Jumbo Limo’s 42" Flat Screen LCD TV. Everything on this party bus is bigger and better. Incredible sound isn’t the only treat you get with this awesome vehicle either. There is an assortment of colored fiber optic and laser lighting found throughout the limo that will help create the perfect mood for any occasion. There is even an authentic fog machine for those groups that like to take the fun to the next level. Maybe you forgot to workout before you got on board? Well then you can make up for that with the built-in dancer's pole that the party bus features. You can make as much of a fool of yourself as you want just remember what happens on the party bus stays on the party bus. The choice of music that you listen to during your ride is totally up to you and your group too. We would be happy to share our proprietary owned music with you or feel free to play your own media such as cd’s, dvd’s, mp3’s, mp4’s, ipod’s, satellite radio or any Bluetooth activated smart devices right over our incredible sound system. Need a little refreshment as you ride around in our Lakeland party bus or journey on to your destination? That’s not a problem at all. You can bring your own legal beverages on board with you and you can even use our two ready-to-pour beer taps. You don’t even have to leave this amazing limousine to keep the party going. No other professionally driven rental vehicle in Lakeland FL offers you the size and variety of entertainment that the areas ultimate party bus does. Without a doubt very few vehicles on the planet can set the tone and atmosphere for a fun-filled day and evening as Lakeland Party Bus can. The whole time you are with us you will be driven around by one of our experienced, professional and courteous chauffeurs. These skilled drivers know Lakeland and the surrounding communities such as Orlando and Tampa very well. You can choose the destinations that you want to go to or they will be more than happy to provide you with some assistance with your choices as they might better know the area your adventure is taking you to. So whether you want the ultimate tailgate experience for a Bucs, Marlins or Lightning game, or you just want to attend a large group event in style make sure you talk to us about all that Lakeland Party Bus can do for you. Absolutely don’t forget that our party bus will also help make any bachelor or bachelorette party the most incredible experience for all too. It also makes the perfect way to thank a group of your employees for their hard work and dedication with a relaxing and fun night on the town. So as you are planning your next large group event give us a call and we will tell you all the reasons why Lakeland Party Bus is the perfect vehicle for that event. It will definitely help you and your group has the time of your lives as you share your adventure together in a safe and worry free environment. Call Lakeland Party Bus at 863-209-7570 for a free quote today, and reserve your epic party of the century today! Send It! Ready to Party!